Kundapur, June 26, 2017: In tragic incident woman dies after she jumped off the moving jeep with fear as the axle broke on June 26, Monday in Kodachadri in Kundapur. The deceased is identified as Savitha(32). 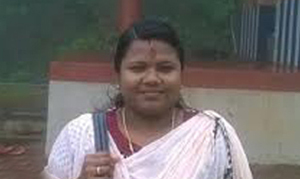 She was government employee in Kasargod. Sources said that Savitha along with her husband Biju and six others from Thrissur had been to Kodachadri. On their way back from temple the axle of the jeep broke, with fear Savitha jumped off the vehicle. On noticing her Biju too jumped to rescue her, but to her fate the jeep hit her head and was bleeding profusely. She breathed her last on the way to hospital. Biju escaped with minor injuries. Hosanagara police are investigating the case.